In a sauce pan, warm almond milk with vanilla until simmering. While warming milk, divide 1/4 cup chocolate chips into your favorite mugs. When milk is simmering, remove from heat and divide into mugs. Stir until chocolate chips are melted. Set aside. Remove coconut cream from can (without the liquid- that can be stored for a later use) and whip with a hand-held mixer until fluffy. 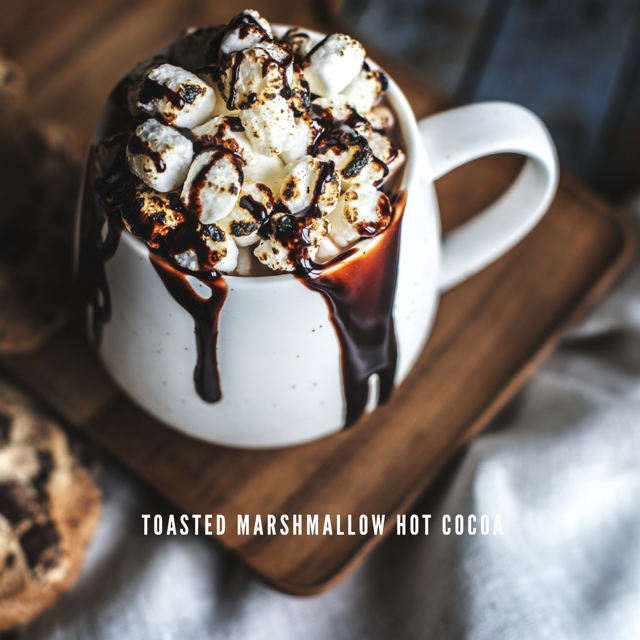 Dollop coconut whipped cream atop the hot cocoa in the mug, sprinkle marshmallows on top. For the “toasted” affect, use torch to brown the marshmallows and then sprinkle cinnamon or cocoa powder on top.